Veteran Democratic Socialists of America member Dolores Huerta joined protestors at the San Antonio offices of Texas Republican Sen. Kay Bailey Hutchison, December 6. Medina let the cat out of the bag on the real reason for D.S.A. 's push for illegal alien amnesty during a speech At the America's Future Now! conference in Washington, DC on June 2, 2009. Medina revealed that legalizing 12 million illegal aliens would create at at least 8 million new Democratic voters to create "a governing coalition for the long term, not just for an election cycle..."
It will also give Hispanics political clout in this country by being able to vote their own into office by their sheer numbers. These Hispanic advocates have had their eye on the brass ring for some time now. How many of these protesters have died yet? Come on. Keep on starving yourselves. Let them hurt themselves with a hunger strike, what will this acomplish. Our mistake and has been for many years, is the mistakes both parties have made in failing to find a solution to our immigration problem, and that leads to a border problem. You my as well say that we ourselves have given these people the clout, they have. For gosh sakes our Government has refused to see them as a problem, that is a major concern to me, that our Government can do everything but seem even to want to tackle this pesky, expensive, crime ridden problem. If they demand things from us, and get them they already have clout. We are the stupid ones, for allowing this to happen, and we did let this happen. When you let a problem esclate to a problem of no return, we are in deep trouble. 1. To close tightly: clench one's teeth; clenched my fists in anger. 2. fist salute and sometimes, reportedly, with the burning of the American flag. I remember when this took place in LA. It was followed by the Maywood demonstration. 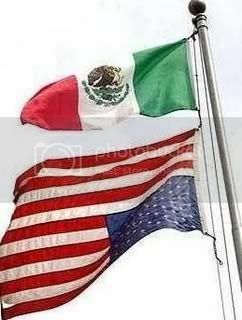 I was one of the Minutemen in Maywood when they hoisted the Mex, flag over the PO and the US flag was upside down. So...........what happens when Dream Act fails to pass? They all go out to eat? That seems to be an interesting choice of words. It implys, IMO, that they HAVE voted in an election cycle.